It's been a quiet season so far for the Hurricane Watch Net (HWN), but Hurricane Joaquin, now a Category 3 storm, has been keeping net members busy this week. Joaquin hit the Bahamas on September 30, with maximum sustained winds of 120 MPH. After initially activating on September 30 at 1500 UTC on 14.325 MHz, the net took a break on October 1 at 0445 UTC, as conditions deteriorated on its nighttime frequency of 7.268 MHz. The HWN resumed operation a few hours later on 20 meters at Alert Level 5 -- Catastrophic Response Mode. WX4NHC at the National Hurricane Center (NHC) also activated on October 1. "This storm has gotten huge and very ugly," HWN Manager Bobby Graves, KB5HAV, told ARRL on October 1. Residents along the US East Coast should closely monitor the progress of Joaquin." The NHC said Joaquin would batter the Central Bahamas with hurricane-force winds and heavy rain and storm surges into the evening of October 1. The storm was expected to generate rainfall totals of 10 to 15 inches over the central Bahamas. The NHC has predicted that Joaquin would turn toward the west-northwest late on October 1, followed by a turn to the north and an increase in forward speed on October 2. The 5-day projection for Hurricane Joaquin would place the storm off the coast of North Carolina as early as October 4 and headed toward Southern New England. States of emergency already are in effect in Virginia and New Jersey, but it's still unclear whether the storm will make landfall or remain offshore. Some ARES units are already preparing for possible activation. During HWN activations, the net control station requests measured/observed "ground-truth" data from stations in the affected area. The HWN is available to provide backup communication to official agencies, such as emergency operations centers and Red Cross officials in the affected area. The net also will gather and report to FEMA officials in the NHC any information on significant damage. Stations should not check into the net unless specifically requested to do so. The NHC said swells generated by Joaquin will affect portions of the Bahamas over the next few days and will start affecting portions of Florida's eastern coast and the US southeast coast by October 2. "These swells are likely to cause life-threatening surf and rip current conditions," the NHC predicted. "We're monitoring the situation and the forecasts regularly. Like most, we're waiting to see which way the storm will go," ARRL Emergency Preparedness Manager Mike Corey, KI1U, told the ARRL Field Organization leadership in areas that could be affected by Joaquin. "ARRL Headquarters will be in touch with our National Voluntary Organizations Active in Disaster (VOAD), FEMA, and NHC as things develop." Visit the HWN website for the latest information on this storm and HWN activation plans. The ARRL has again urged the FCC to go forward with a proposed new Amateur Radio allocation at 472-479 kHz (630 meters) and to establish service rules for Amateur Radio operation at 135.7-137.8 kHz (2200 meters). The League reiterated its August 31 arguments in favor of flexible FCC Part 97 regulations in its September 30 reply comments to the FCC's April Report and Order, Order, and Notice of Proposed Rulemaking (R&O/NPRM) in ET Docket 15-99. That R&O/NPRM raised several questions regarding how Amateur Radio might coexist with PLC systems used to control the power grid. Targeting comments filed by the Utilities Telecom Council (UTC), the ARRL called on the Commission to ignore UTC's call not to allocate 630 meters to Amateur Radio. It asked the FCC to implement a notification procedure for amateur stations within 1 kilometer (0.62 miles) of a transmission line carrying PLC and where the PLC system is operating on frequencies within or which overlap the 2200 or 630 meter bands. "The comments of UTC, without the benefit of any technical component or argument, oppose the allocation of the 630 meter band to the Amateur Service, and suggest overly and unnecessarily conservative regulation of amateur operation in the 2200 meter band," the ARRL told the FCC. "Whatever protection criteria are ultimately deemed to be necessary with respect to the 2200 meter band, those criteria would be applicable and sufficient as well with respect to the 630 meter band," the ARRL said. "There is no technical justification offered by UTC for withholding the 630 meter allocation." The ARRL also urged the FCC to reject what it called "UTC's inchoate proposal" to elevate the unlicensed status of PLCs operating between 9 and 490 kHz, purportedly to protect them from interference "caused by amateur operations," while not making any accommodations to address PLC interference to Amateur Radio operations. "UTC cannot have it both ways: It cannot enjoy the benefits of unlicensed operation under Part 15 of the Commission's rules as a carrier-current, unintentional emitter and at the same time claim the protection afforded an allocated, licensed radio service," the ARRL argued. While the UTC has offered to work with the FCC, the ARRL characterized the UTC's comments as "distinctly unhelpful" in terms of providing information regarding the prevalence and location of PLCs that need protection, the interference potential from Amateur Radio operation and notification requirements, and just how much protection the PLCs actually need. "They are not responsive at all to the plethora of questions asked by the Commission in the Notice," the ARRL continued, "and those points that UTC makes are unsubstantiated." The League said it's willing to work with utilities in setting up a notification procedure to address the unlikely possibility that Amateur Radio operations in the two bands might interfere with critical PLC systems. "In order to implement this, UTC should be called upon to provide to ARRL or to the general public, a list of transmission lines carrying PLC which make use of either of the two subject bands, thus to facilitate notification," the ARRL reply comments said. The League concluded by calling on the FCC to allocate 630 meters to Amateur Radio, as proposed in the Notice, reject UTC's proposal to elevate the status of PLCs, and implement a notification procedure for amateur stations within 1 kilometer of a transmission line carrying PLC in or near the two bands, and to make the LF and MF allocation changes in Part 2 and the Part 97 service rule changes, "as proposed by ARRL and not otherwise." The Amateur Radio Parity Act of 2015 -- H.R. 1301 and S. 1685 -- now has the support of 100 members of the US House of Representatives. Two additional cosponsors signed onto H.R. 1301 on September 24, raising the number of cosponsors to 99. Those members plus the House bill's sponsor, US Rep Adam Kinzinger (R-IL), total 100 proponents, and the number is expected to continue growing. The Amateur Radio Parity Act of 2015 would direct the FCC to extend its rules relating to reasonable accommodation of Amateur Service communications to private land-use restrictions. Kinzinger introduced H.R. 1301 in March, with 12 original cosponsors from both sides of the aisle. Sen Roger Wicker (R-MS) introduced S. 1685 in June, with Sen Richard Blumenthal (D-CT) as the original cosponsor. Recently the League took steps to address objections and concerns raised by representatives of community associations about the legislation. "Clarity on Amateur Radio Parity" makes it clear that the bill would not create new federal policy with respect to outdoor amateur antennas. As it points out, the FCC already recognizes a strong federal interest in effective Amateur Radio communication from residences and has adopted a limited preemption of state and local regulation of Amateur Radio antennas. The Amateur Radio Parity Act of 2015 would extend the limited preemption to private land-use restrictions. H.R. 1301 has been referred to the House Energy and Commerce Committee. Rep Greg Walden, W7EQI (R-OR), chairs that panel's Communications and Technology Subcommittee, which will consider the measure. S. 1685 has been referred to the Senate Commerce, Science, and Transportation Committee's subcommittee on Communications, Technology, Innovation, and the Internet, chaired by Sen Wicker, the bill's sponsor. The ARRL continues to encourage members to write their US House and Senate members urging their cosponsorship of the legislation. Visit the Amateur Radio Parity Act of 2015 page for information on how you can get involved. with a check for $1000 on behalf of the Shy-Wy Amateur Radio Club of Cheyenne, Wyoming. 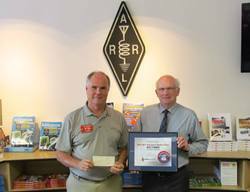 The club's designated its donation to support the League's efforts in Washington on the Amateur Radio Parity Act of 2015. "The ARRL is very appreciative to the members of the Shy-Wy Amateur Radio Club for their generous contribution to the Legislative Issues Advocacy Fund," said ARRL Development Manager Lauren Clarke, KB1YDD. "This fund supports the efforts of ARRL key volunteers and staffers in Washington, DC, on behalf of the Amateur Radio Parity Act, and every donation to help this important work brings us that much closer to our goal." "The exercise scenario will simulate a CME event and focus on actions that radio operators should take prior to and following a CME event," explained Army MARS Program Manager Paul English, WD8DBY. "One thing we want to continue to work on is the interface with the greater Amateur Radio community." Training objectives for this exercise will include understanding what a CME is and how much forecast lead time can be expected; the effects associated with a CME, and what precautions radio operators take to protect their equipment prior to a severe CME. After the simulated CME, operators will assess its effects and begin reporting that information. This will involve "interoperation with Amateur Radio operators and groups to assist in assessment." Individual radio amateurs as well as ARES and RACES teams are encouraged to participate in this exercise. Contact MARS and provide your contact information, if your organization is interested. The ARRL Foundation is accepting academic year 2016-17 applications from eligible young radio amateurs planning to pursue higher education. All applicants must be active FCC licensees and submit an online application. More than 80 scholarships ranging from $500 to $5000 will be awarded in 2016. In addition, one applicant will be selected to receive the prestigious William R. Goldfarb Memorial Scholarship, awarded to a high school senior pursuing a degree in business, computers, medical, nursing, engineering, or science. Students submitting 2016 applications should read the ARRL Scholarship descriptions carefully and apply only for those scholarships for which they are eligible. Some scholarships have geographic criteria or other requirements. All applicants must submit a completed online application. Applicants must also forward a copy of their academic transcripts from their most recently completed school year. Applications without accompanying transcripts will not be considered. Cell phone photos of transcript(s) will not be accepted. All transcripts must be scanned into a PDF and sent via e-mail. Applicants for the William R. Goldfarb Memorial Scholarship must also submit a PDF of their FAFSA form by February 18, 2016, as well as a copy of their academic transcript from their most recently completed school year. Applicants will receive a confirmation message when their applications have been successfully processed. The 2016 application window opened on October 1. Applications for the 2016 scholarship process must be received by 11:59 PM Eastern Standard Time on January 31, 2016. Transcripts must be received by Thursday, February 18, 2016. Award recipients are typically notified by mid-May by USPS mail and e-mail. Read more. On the heels of the September 19 launch of nine satellites carrying Amateur Radio payloads comes word that three more satellites were launched on September 25 from the Jiuquan Satellite Launch Center in Inner Mongolia's Gobi Desert. The CubeSats, identified as Tianwang-1A (TW-1A; SECM-1), Tianwang-1B (TW-1B; NJUST-2), and Tianwang-1C (TW-1C; NJFA-1), were developed by students at the Nanjing University of Aeronautics and Astronautics in collaboration with the Shanghai Engineering Center for Microsatellites. TW-1A and TW-1B are 2 U CubeSats, while TW-1C is a 3U CubeSat. The mission's main goal is to experiment with software defined radio technology in space. The Amateur Radio payloads, which do not include any transponders, will serve to exchange telemetry, tracking, and command information with the ground control station. Telemetry data will be made public, so that radio amateurs around the world may track and monitor the health of the satellites. Other payloads include a video camera, along with receivers for dual-band GPS/BeiDou, Maritime Automatic Identification System, and Aeronautical Automatic Dependent Surveillance Broadcast. 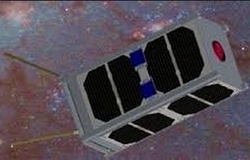 Using MEMS-based cold-gas micropropulsion, it is planned to demonstrate formation flying by two of the CubeSats along with inter-satellite communication using GAMALINK 2.4 GHz spread spectrum technology from Portugal. The League's former Washington Coordinator and veteran ARRL Headquarters staff member Perry Williams, W1UED, of Unionville, Connecticut, died on September 25. An ARRL Life Member, Williams, who would have turned 87 in October, spent 4 decades on staff before retiring in 1994. That same year, he was named as Dayton Hamvention's Amateur of the Year. In 2002 he returned to ARRL Headquarters in a part-time position as the League archivist. Perry Williams, W1UED, in his ARRL office. "If Perry didn't know something about ARRL history, it wasn't worth knowing," commented ARRL CEO David Sumner, K1ZZ. "I worked for Perry when I joined the full-time ARRL staff in 1972 and couldn't have asked for a better mentor." A radio amateur since 1951, Williams came to ARRL Headquarters in April 1954 as an assistant secretary, which, as Sumner explained, meant that Williams "was expected to be able to answer just about any question about Amateur Radio regulations, both nationally and internationally, and to do whatever the Secretary and General Manager needed done." 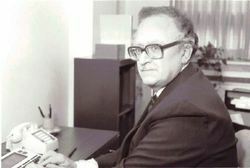 After rising to senior assistant secretary, in 1977 he was named manager of the Membership Services Department. Three years later, he became the ARRL's Washington Area Coordinator, spending a couple of days a week in DC as the face and voice of Amateur Radio on Capitol Hill and at the FCC and working with ARRL General Counsel Chris Imlay, W3KD (then N3AKD), and Washington-area volunteers. 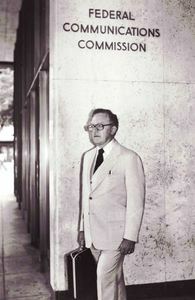 Over the years, Williams contributed an extensive list of columns and articles to QST. After returning to Headquarters part-time in 2002, Williams continued as archivist until February 2011. "It was my great privilege to work with Perry Williams, W1UED ('usually eats dinner' were his self-chosen phonetics for that call sign), on ARRL advocacy issues. Perry was extremely proud to wave ARRL's banner in the halls of Congress at the FCC and in a good number of other Federal agencies where Amateur Radio had business." Imlay said. One of Williams's greatest accomplishments included talking Congress out of charging amateurs a license application fee; instead he argued convincingly in favor of creating a vanity call sign program. "Perry thought -- accurately -- that amateurs would be willing to pay for services that they got from FCC, but that they would be very unhappy to pay application fees that didn't translate into something that benefited them," Imlay said. "Congress bought Perry's argument, and so we now have vanity call signs and no application fees." Imlay said Williams also crafted a plan for the Amateur Service not only to retain large segments of microwave spectrum that a bill in Congress would have surrendered for commercial interests, but to create a primary allocation around 2.4 GHz. Prior to joining the ARRL staff, Williams served as a radio operator with the US Air Force Strategic Air Command for 6 years, before and during the Korean Conflict. In his younger years, he was active as a Boy Scout leader, once directed two church choirs, and enjoyed playing the accordion. A memorial service will be announced. Survivors include his wife, Martha, and four children. 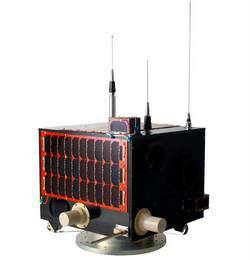 LAPAN-A2 FM and APRS Satellite Launched: It's getting even busier in space. Indonesia's IARU Amateur Radio society ORARI reports that the LAPAN-A2/ORARI satellite was launched on September 28, from India. LAPAN-A2 is in a 650 km orbit and takes about 110 minutes to orbit Earth. The low-inclination equatorial orbit of 6° to 8° means it will be receivable only from about 30° N to 30° S, limiting the satellite's accessibility to users outside of that footprint. LAPAN-A2 has been heard. It now is undergoing activation and systems testing, and it is expected to be 1 month before the Amateur Radio FM transponder will be generally available. The primary aims of the mission are Earth observation using an RGB camera and maritime traffic monitoring using AIS -- both using frequencies outside the Amateur Satellite Service. The telemetry beacon is on 437.425 MHz; the FM voice uplink is 435.880 MHz; the FM voice downlink is 145.880 MHz. 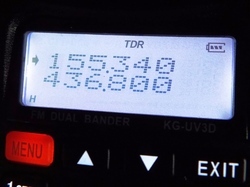 The transponder runs 5 W. The APRS digipeater is on 145.825. Reports are welcome. CQ World Wide DX Contest Committee Conducting Survey: The CQ World Wide DX Contest Committee is conducting a survey to gather feedback about the contest from participants. An invitation with a link to the survey has been sent via e-mail to everyone who submitted a log in the 2014 SSB and CW CQ WW events. "The responses will help us improve the contest and make important decisions about the rules," the CQ WW Contest Committee said. Anyone who has participated in the CQ WW DX Contest in the past 3 years is invited to take the survey, which is available in five languages and should take about 10 minutes to complete. Participants should only take the survey once. The deadline to submit surveys is October 10. Tad Cook, K7RA, Seattle, reports: Solar activity spiked again this week, with average daily sunspot numbers rising from 73 to 120.9. Average daily solar flux tracked upward too -- from 106.7 to 122.7. Predicted solar flux is 130 on October 1-2; 120 and 110 on October 3-4; 100 on October 5-8; 115 on October 9-10; 110 on October 11-12; then 115, 120, and 125 on October 13-15; 130 on October 16-18; 125 on October 19; 120 on October 20-24, then 130, 125, 120, and 115 on October 25-28; 110 on October 29 through November 1, and 115 on November 2-6. Predicted planetary A index is 8, 20 and 22 on October 1-3; 28, 16, and 12 on October 4-6; 8 on October 7-8; 10 on October 9; 8 on October 10-14; then 12, 10, and 12 on October 15-17; 8 on October 18-24; 7 on October 25-27; 15, 10, 7, and 15 on October 28-31, and 12, 8, and 12 on November 1-3. Monthly averages of sunspot numbers for May through September were 83, 77.4, 68.5, 61.7, and 72.5. The 3 month moving averages of daily sunspot numbers centered on January through August were 98.2, 78.1, 68.2, 72.4, 77.7, 76.3, 69.1, and 67.5. A 3 month moving average centered on August has a sum of all sunspot numbers from July 1 through September 30, and divides by 92, the number of days. A 3 month moving average centered on July incorporates all data from June 1 through August 31.